Nothing impacts the success of a business more than people. With the right team, a business will grow and reap the rewards of success! However, finding fantastic talent to join your team is the biggest challenge that all businesses face. Something that has a big impact on the recruiting efforts of businesses is the current job market. If you’re a business owner or manager involved in recruiting new staff, having an understanding of the job market is vital. Why? Because employers need to tailor their recruiting methods in order to overcome current challenges and successfully attract talent to join their businesses. We’ve partnered with Bridgewater Recruitment Group to bring you the latest insights into the current job market. We also explore the challenges that this raises for employers who are looking to attract and recruit new talent in 2018. High employment rates are helping candidates to feel secure. This confidence is encouraging them to look for better job opportunities. We’re seeing the highest number of job vacancies since records began. With unemployment at a record low and available vacancies at a record high, the power lies firmly in the hands of job seekers. Employers are having to do more to effectively compete for top talent. 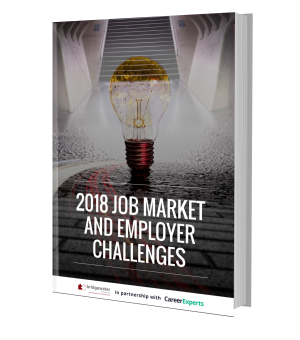 Download the Job Market 2018 whitepaper here!